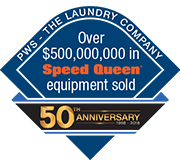 PWS the Laundry Company is growing and looking for knowledgeable and motivated individuals to expand our team. Our current job openings are listed below. Click on a job for the description. We are looking for an energetic customer-service agent for our rapidly growing Los Angeles based Internet parts and supplies business. Job duties will include answering customer requests via phone, chat and email, processing received orders into our ERP system, and tracking and following open orders to final shipment. The position requires constant communication with our suppliers and customers, on the telephone and via chat and email. The candidate must possess superior people and communication skills. A track record in providing excellent customer service is required. The successful candidate will be fluent with web, email and Microsoft desktop application suites. Experience using Sage MAS ERP and CRM applications is desirable. Experience in a commercial parts business is a plus. PWS offers a competitive salary and benefits packages, including Medical/Dental/Vision and 401(k) plans. Performs all order processing activities (order entry, expediting, order status, inventory availability, basic product information, quotations, and post-shipment issues) accurately, professionally and in a timely basis. Collaborates with Shipping, Technical Services, Accounting, and Fulfillment personnel, to create solutions to meet customer requirements. Communicates verbally and in writing in a professional, friendly, and timely manner, at all times. Displays a positive attitude to ensure customer satisfaction. Prior experience in customer service or call center teams. ERP, order entry and order management systems experience. Proficient in Microsoft Office suite and Google apps. Organized and effective time management skills to balance competing work assignments and specific deadlines. Results oriented and ability to work with cross-functional departments and all levels of people. We are looking for an energetic warehouse staff member for our rapidly growing Los Angeles based parts and supplies fulfillment center. Job duties will include picking of customer orders and rotating duties to include receiving, shipping and inventory maintenance. The position requires computer fluency with web, email and ERP applications. Experience using Sage MAS ERP or equivalent applications is desirable. Executes warehouse and order fulfillment activities, including picking, receiving, shipping and inventory management as directed. Assures activities are performed accurately, professionally and achieve the company’s metrics for customer satisfaction. Collaborates with other PWS employees as necessary to create solutions to meet customer requirements. Recommends and implements improvements to order management processes, systems and related improvements. Communicates in a professional, friendly, and timely manner, at all times. Displays a positive attitude to ensure customer satisfaction. We are currently looking for a Service Technician for our Los Angeles Office. We are looking for a high-energy candidate, capable of working in a fast-paced, challenging environment to perform service on commercial laundry equipment. Must be able to perform general service calls, troubleshoot, make major and minor repairs, and perform maintenance and some installations. Excellent communication and Customer Service skills are required. The ideal candidate will be able to initiate action and seek opportunities to excel. This position has great potential for growth. Technical/Repair background - Preferably commercial appliance repair. Must be able to resolve problems and handle conflicts in a professional manner. Team-player with the ability to work under pressure. Exposure to sales environment and real estate a plus. We are currently looking for a Service Technician for our South San Francisco Office. We are looking for a high-energy candidate, capable of working in a fast-paced, challenging environment to perform service on commercial laundry equipment. Must be able to perform general service calls, troubleshoot, make major and minor repairs, and perform maintenance and some installations. Excellent communication and Customer Service skills are required. The ideal candidate will be able to initiate action and seek opportunities to excel. This position has great potential for growth. Note: If you're having problems submitting the form, please give us a call.